Food (and Booze) Events to Look Forward to in October! This annual Italian feast benefits the Italian American Museum of Los Angeles and rightly features all things Italian, including restaurant sponsors such as Il Pastaio, Locanda del Lago, Paciugo Gelato while the beverage sponsors include Fernet-Branca (!) and San Antonio Winery. 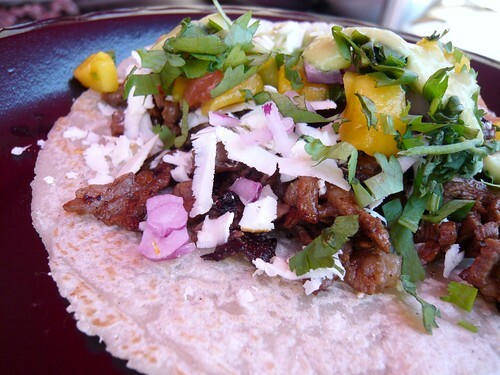 Cross the border for the first ever Baja Culinary Fest! The extravaganza actually starts on Wednesday, Oct 5 with cooking competitions, food-related movies, hunting for your own lunch (seriously), winery or cheese tours and various special dinners in Tijuana and Ensenada. Take a week off and go to all of them if you can, but if you can't, the main festival takes place on Saturday Oct 8. 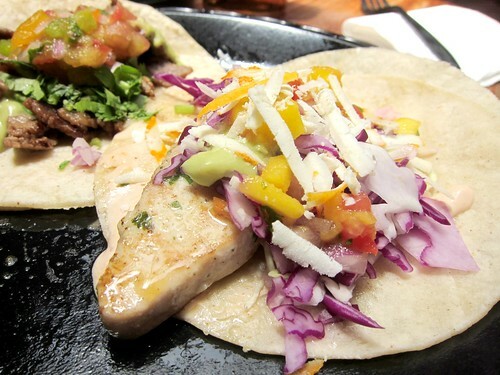 Restaurants, street food, and can you say tequila? Also, stay for the lobster festival in Rosarito Beach on Sunday if you have the time ($25pp). Savor the Season returns to benefit Break the Cycle, an organization to end domestic violence. The restaurant lineup includes Jar, M Cafe de Chaya, Oyster Gourmet, Morton's Steakhouse, and Beachy Cream. Here's a recap of their past event. $100 for general admission (or $150 for two), $250 for VIP ticket. The LA Beer Float Showdown returns for its third year. This time 5 chefs are pairing up with 5 breweries to compete for the title, including Chef Ilan Hall (The Gorbals) with Tustin Brewery, Chef Laurent Quenioux (Vertical Wine Bistro) with Beachwood BBQ, chef CJ Jacobson (The Yard) with Firestone Walker, Chef Andre Guerrero (The Oinkster) with Eagle Rock Brewery, and Chef Thi Tran (Starry Kitchen) with Ladyface Ale Company. 1-4pm. Eagle Rock Brewery. 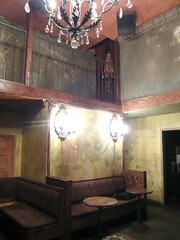 3056 Roswell St, Eagle Rock, CA. Dionicess returns with craft beer cocktails to Steingarten LA. This time, they have recruited bartender Matt Biancaniello to craft some beer cocktails. Each of the 5 cocktails will come with 5 vegetarian dishes served by Randy Clemens (author of The Sriracha Cookbook). 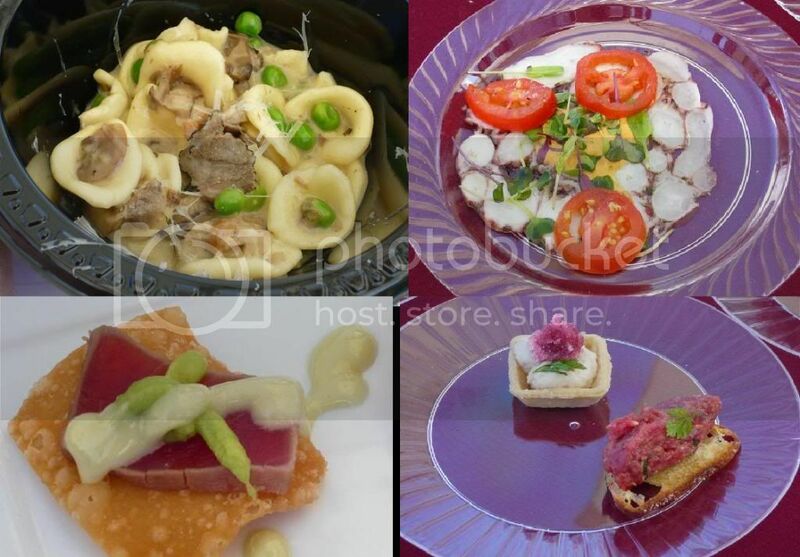 One of my favorite annual food events returns to Saddlerock Ranch in Malibu featuring Farmshop, Eva Restaurant, Stella Rossa, Lukshon, MB Post, The Royce, Rivera, Nancy Silverton and Amy Pressman's new burger joint, Short Order, and so, so much more. To see posts from previous years, click here and here. It's THE beer event of the year! The Festival will feature over 70 breweries pouring a wide selection of their beers including rare beers and some special beer week-only beers. There will also be a selection of food trucks and local artisans. $45 pre-sale, includes unlimited 4 oz pours of beers. We get excited over restaurant openings touting famous chefs or restaurant groups these days, but some little-known, family-owned places are serving up some great food without all the hullabaloo. Such is the American Farmhouse Tavern in Manhattan beach, which recently moved from a 35-seat restaurant to one down the street that seats 135. 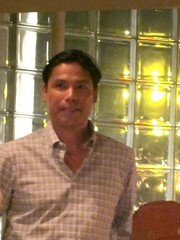 I was invited to a recent press dinner. We convened at the bar for some appetizers including toast with creamy guacamole and salad topped with tender, juicy slices of tri tip. 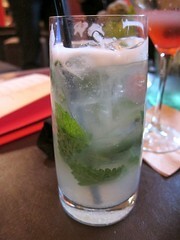 A good and potent drink that I should've ordered when I have some food in my tummy. 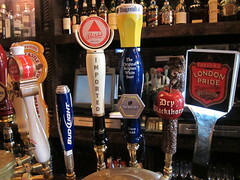 They also have a good selection of beers on tap, including Allagash White ($8). There are tons of happy hours and daily specials too, including $4 wine/beer/well drinks/appetizers on weekdays (11-2pm, 4-6:30pm) and Fridays and Saturdays from 9pm on, $3 draft beers on Mondays, etc. American Farmhouse Tavern is run by owner/chef Orlando Novoa who hailed from Santa Maria. Appropriately, the restaurant serves Santa Maria style barbecue like grilled meat and fish alongside Central Coast wines. They proudly grill their meat over Central Coast red oak (the wood comes from fallen trees so it's sustainable). The Farmshop is one place I've been hearing a lot about from the new-ish Brentwood Country Mart (other than the Sweet Rose Creamery, of course). From what I've heard, the Farmshop was expensive but have great food. The former made me a bit reluctant but one day I decided to give it a try. As with most brunch places in this city, there was a wait for a table (about 15-20 minutes) and we walked around the Country Mart to kill time. Yes, the prices here are pretty high but the ingredients they use are absolutely amazing. This may be the creamiest avocado I've had lately, perfectly ripe, making a healthy yet satisfying dish. The tomatoes were sweet and bursts in your mouth. 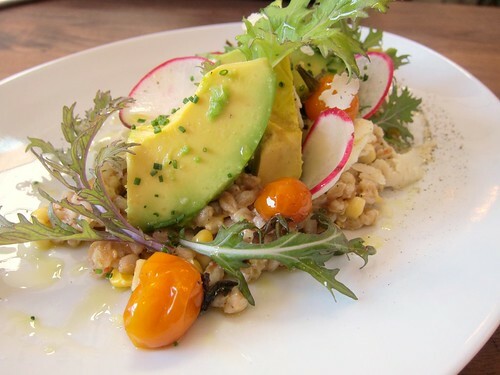 We loved this dish and I'm saddened to think the peak avocado season is over. This was another hit and one dish that I kept thinking about for a few days after. 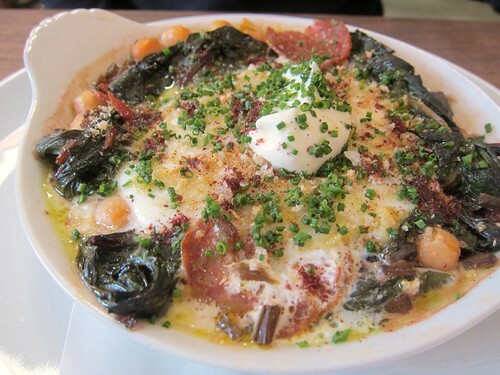 I loved eating the runny yolk with the earthy kale and chickpeas. There was just the right amount of yogurt to bring the flavors together. 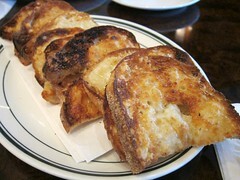 Scoop them all up on the sourdough toast. On my last night in Albuquerque, I had dinner with a group of friends and decided to let the local decide where to go. There were quite a few constraints. She had her kid with her so it'll have to be a place where she can bring him. My other friend wanted to check out the Nob Hill area. There has to be alcohol, and it can't be very expensive. We ended up at Kelly's Brewpub, a popular local hangout - probably partly because it's a sports bar and partly because they have 20 of their own brews at a pretty cheap price (you can also apparently make your own beer here). The food is your typical bar food, and from the little I tried they're pretty mediocre. 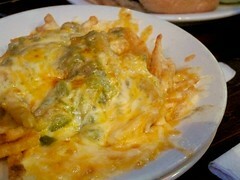 We did like the green chile cheese fries, because it's hard to go wrong with that. The latest buzz on pizza in LA has been coming from Stella Rossa Pizza in Santa Monica. Stella Rossa is a sister restaurant of and shares an entrance with M Street Kitchen on Main St. The chef, Jeff Mahin, comes from a fine dining background, including The Fat Duck and L2O. He says he's now doing what he's always wanted to do, making pizza. 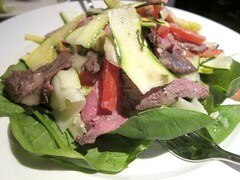 (Is it just me or is there a movement of fine dining chefs turning into making sandwiches and burgers and pizzas). Upon placing our order, the server suggested we order a different appetizer since we're getting a white pizza, but my friend has never had burrata before so I insisted that we order some. 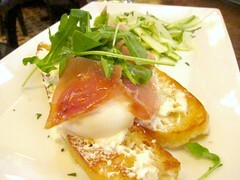 The burrata is made locally (in Baldwin Park) by Di Stefano and was one of the creamiest you can find in this city. 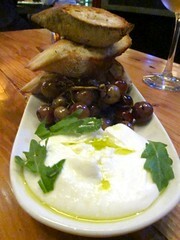 I would've been very happy with the burrata and olive oil alone, but the sweet grapes made for an amazing accompaniment. Every piece of grape I had that night was sweet and ripe. Remember the scene in Ratatouille where Remy makes Emile try eating a chunk of cheese and a piece of grape at the same time? So, I've posted a truffle recipe from Valerie's Confections before and it does look easy enough, but I still have never gone ahead and tried it. Maybe it was still harder than it sounds. 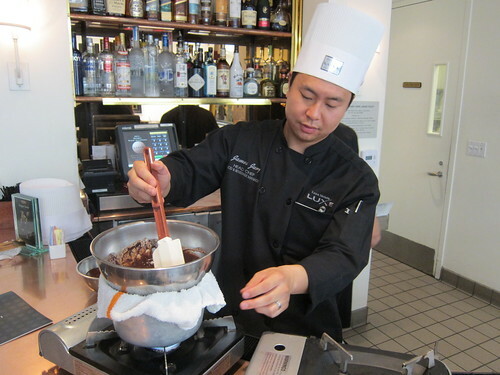 But after watching a truffle making demo at Luxe Hotel, I have to say it's looking easier. 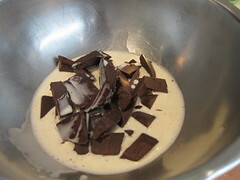 The boiling water is covered with a moist rag, and the bowl with the chocolate and cream is placed over that. The same man who brought you SmithHouse in Century City, Curtis Nysmith, has also brought you Blue Boar Pub (both spaces also designed by Spacecraft), a traditional British pub in the middle of Hollywood. As this is a British pub after all, there are some (eight?) beers on tap including Dry Blackthorn cider, London Pride, etc, plus some "standards" (uh, Budlight). As the name suggests, the Dry Blackthorn cider is less sweet than the usual cider, and I recommend it. It turns out, though, that it's the cocktails that were the highlights of my visit AND, the cocktails are only $10! 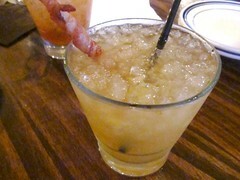 I immediately fell in love with the William Wallace, made with Famous Grouse, ginger syrup, honey, candied ginger, angostura bitters. 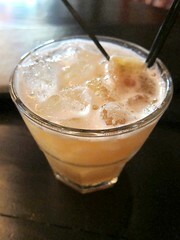 If you like ginger drinks, this one is a must! The An family has probably created the first high-end Vietnamese restaurant empire starting with Crustacean and now AnQi in Costa Mesa and Tiato Cafe in Santa Monica. Where Crustacean focuses on more traditional Vietnamese, AnQi and its chef Ryan Carson leans more towards Asian fusion. AnQi is divided into three sections: there's the main dining room, there's the bar with a separate bar menu, and then there's the noodle bar (also serving dumplings). On Mondays, you can say there's four. There's the private dining room where you can partake in the molecular gastronomy menu (which I still need to review, soon). During the Red Hour (M-F, 4-7 pm) all the cocktails are 50% off and some of the small bites from the bar menu are discounted. They recently invited some bloggers for a hosted Red Hour. 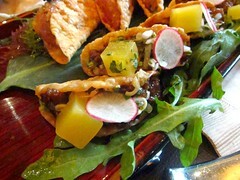 We shared some fusion bar bites from an Australian crudo served with yuzu kosho granita, yuzu nuoc nam, and kaffir lime ponzu (three separate sauces) to Ahi Tuna Poke and spicy beef tongue crispy tacos. 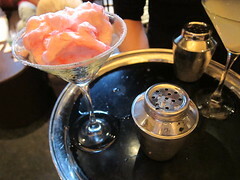 In keeping with the molecular side of the restaurant, there's a cocktail with cotton candy similar to that of Bazaar's. The Lotus is made with pink grapefruit and orange with vodka and tequila over pink cotton candy. I personally liked the Viet-No-Jito which is vodka with hand-muddled fresh lime and Kinh Gioi leaves, green tea infused with agave nectar and molecular lemon foam. The Kinh Gioi are often called Vietnamese Balm or Vietnamese Mint and added a really nice aroma to the drink (it would be better if it was rum-based, though - and same goes with most of their cocktails). 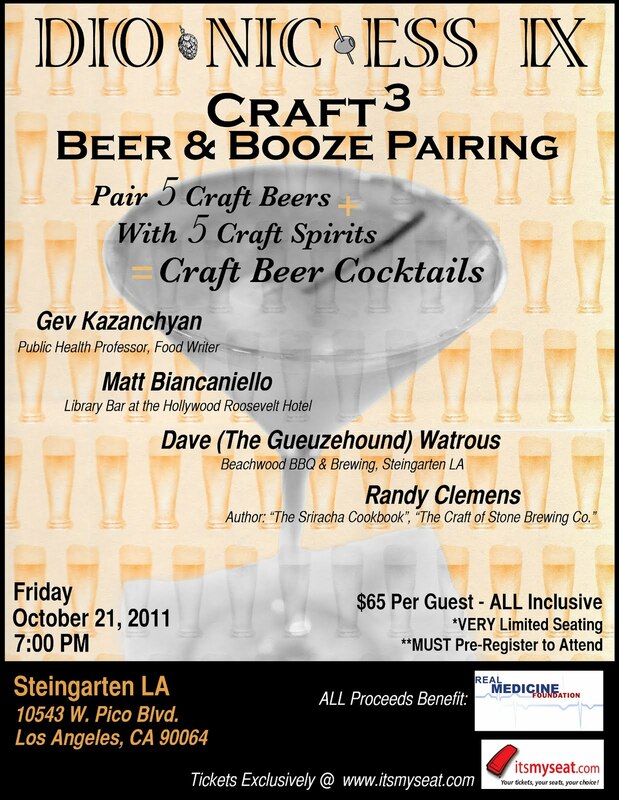 On October 21, Dionicess returns with craft beer cocktails to Steingarten LA. 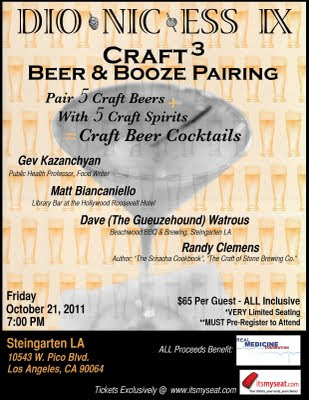 Public health professor Gev Kazanchyan is teaming up with Dave Watrous from Beachwood BBQ Steingarten LA for a one night fundraising event. 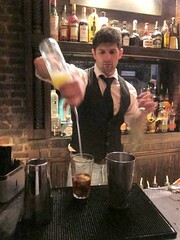 This time, they have recruited bartender Matt Biancaniello to craft some beer cocktails. Each of the 5 cocktails will come with 5 vegetarian dishes served by Randy Clemens (author of The Sriracha Cookbook). The event costs $65 per person (all inclusive) and all proceeds benefit Real Medicine Foundation. There are only 30 seats available so grab yours now here! There aren't too many Indonesian establishments around LA, so I can't help be excited when I hear about one. Wandering Chopsticks told me there was a new Indonesian dessert store in Alhambra. How did she know it was Indonesian? She saw the name was "Salju Desserts" and googled the word. Yep, salju means snow in Indonesian, so as you can probably guess, it's a shaved snow (and ice) store! The difference between a shaved snow and ice is that shaved snow is made with a block of ice that contains condensed milk in it. 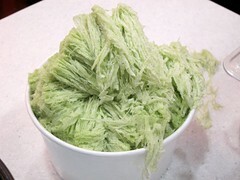 At Salju, the snow is also flavored. 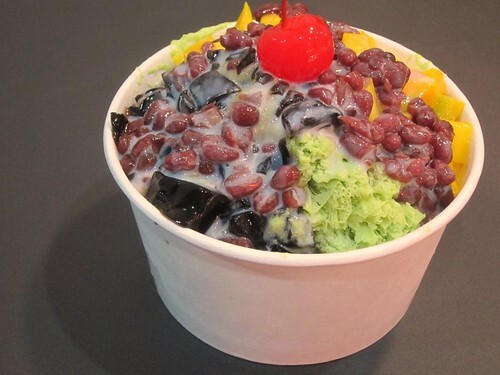 One order is $5.50 for shaved snow (choose from taro, green tea, mango, and other flavors) and three toppings (choices include jackfruit, red beans, grass jelly, mochi bits, nuts, and other fruits). It's automatically topped with more condensed milk. The shaved snow I think is still not as good as Class 302 as the one here is still shaved with a normal ice shaver (Class 302 uses a special one that shaves them into wide ribbons and gives it an even better texture). 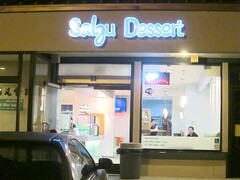 Still, Rowland Heights is quite far for many of us and Salju Dessert is a pretty good alternative that also offers more flavors and topping options than Class 302. Plus, I have to support my fellow Indonesians! Not too long ago, I won a brunch for two at The Misfit in Santa Monica via Caroline on Crack. The Misfit took over the old Anisette Brasserie space and is the newest addition to the LGO Hospitality Group (they're responsible for La Grande Orange and the Luggage Room Pizzeria). We weren't expecting the asparagus to come in thin slices, but it works for the crisp texture they were going for. Unlike the usual tender, boiled asparagus, these are crunchy - almost like celery. 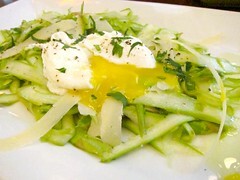 It's a nice texture contrast with the egg yolk, and the flavors mostly came from the parmesan. I wished the server would've told us this dish came with the asparagus salad too, because we would've ordered a different salad. This dish might've been better served with their english muffin instead of the toast. When Bill the Street Gourmet LA invites you for some tacos, how can you not go? 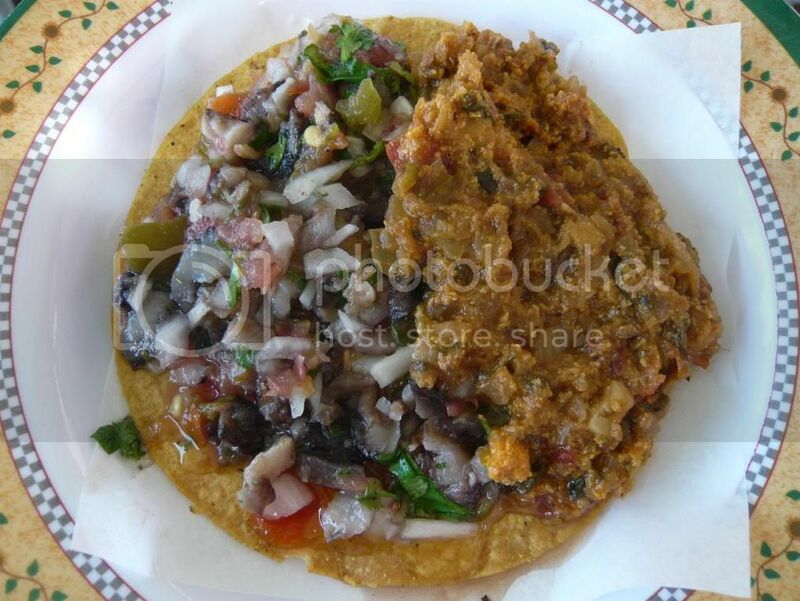 This time it's not a purist, authentic regional Mexican food, though, but Soho Taco, a Santa Ana-based catering company serving "modern" tacos but still has traditional meats, toppings, and fresh tortillas. Since SoHo Taco currently only has catering (according to them, a food truck will be hitting the streets in October), they and Bill had to find another venue to have the lunch. Well, Bill lives nearby and a well known regular at La Descarga, so we lucky friends not only had some tacos, but also got to see La Descarga in daylight for the first time. When I was a UCLA student, my food options seemed to have ranged from Sak's Teriyaki to Gushi to In-N-Out. Oh, how lucky the current students are. Fundamental LA opened just South of Wilshire not too long ago, serving quality sandwiches and good beer at inexpensive prices. While I don't normally order chicken, they convinced me when they said there's only chicken thigh meat in this sandwich (dark meat FTW). I liked everything about this sandwich, from the moist and flavorful chicken, the fact that it's not overly heavy and filled with guacamole or sour cream, to the crunchy bread, and the sweet tomatoes and pickled jalapeno that refresh your palate. The menu changes constantly, even if the main meat stays the same. 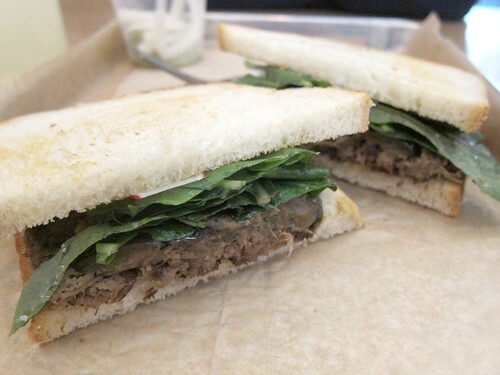 On my first visit we had and loved the short rib sandwich with curried eggplant on sourdough. On my last visit this was served with kimchi. Regardless, the short rib is always excellent. Often, chain restaurants get automatically passed over - sometimes, they shouldn't be. With about twenty locations, Daily Grill is almost a big chain/corporation, but they're certainly not franchises. Not too long ago, they decided to up the ante by installing meat grinder in their restaurants and start grinding meat for their burger twice a day. My fellow bloggers have tried this burger and said that they are actually pretty good, so I accepted their invitation to taste them myself. 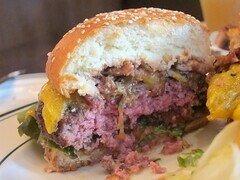 I joined Daniela, who recently started working for Daily Grill's PR company, for lunch at their downtown location. Nice crunch and weren't overly heavy. A good opener and side dish. 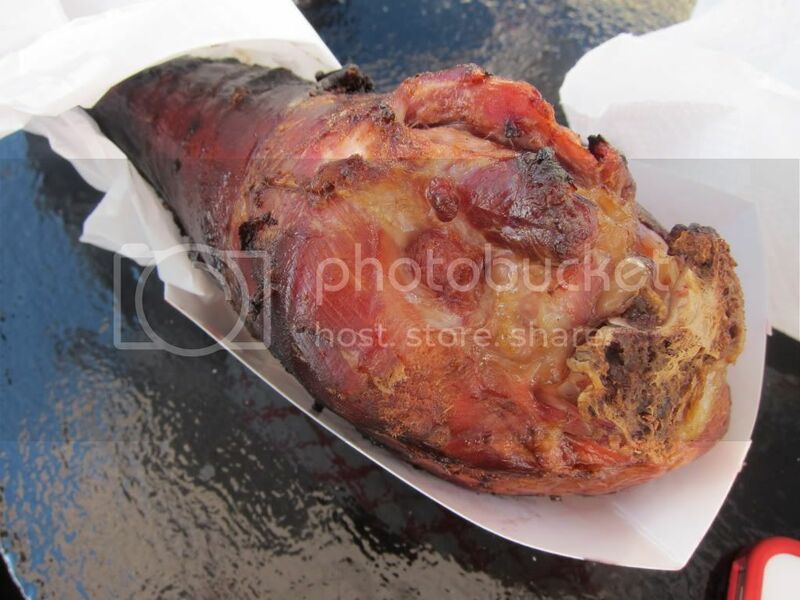 The Foods of LA County Fair. 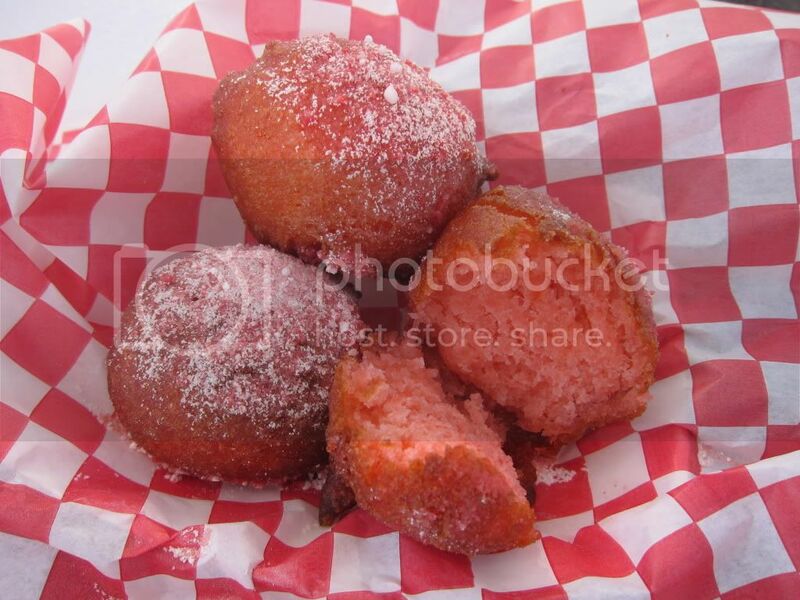 Oh, Deep Fried Kool Aid! It's time for the LA County Fair! Starting this weekend: Rides, live animals, and of course ... food! The fair runs from Sept 3-Oct 2 (closed Mondays and Tuesdays), but for the first time, this year they invited food-related media in before the Fair opens so we can sample some of the food they offer. The fair's "specialty" is all the weird fried food from Chicken Charlie's. We didn't get to sample everything but we did try their new fried bbq ribs and the fried Kool Aid! Think of flavored donut holes (cherry flavored donut holes, perhaps?) dusted with Kool Aid powder. They're actually pretty good, not as weird as I thought they might be! Surprisingly, they're also not as greasy as many donut holes. We heard that the LA County Fair special will be "caramel apple fries" - if you get to try these, let me know what they're like! 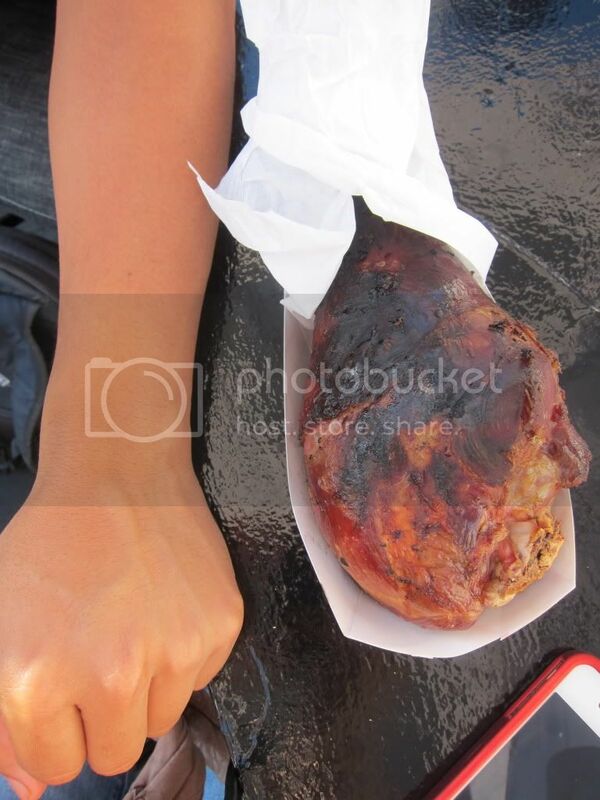 For fairs and festivals, a must-item for me is a smoked giant turkey leg! Here they're served by Big Bubba's BBQ. (here's a pic for size comparison).